On I-565, take exit 14, heading south toward Gate 9/Redstone Arsenal - travel 1.2 miles to Gate 9. After clearing the gate, move into the left lane and prepare to make a U-turn at the flashing lights. Make a U-turn, reversing direction onto the road that parallels the road you entered on. At the stop sign (adjacent to Gate 9) turn right onto Goss Road that immediately swings north, traveling along the golf course. At about one mile, Goss Road makes a sweeping curve to the east. Follow Goss Road 1.5 miles. You'll see an "RV Campground" sign on your right just before Jupiter Street, Turn right onto Jupiter Street and follow it to the campground. 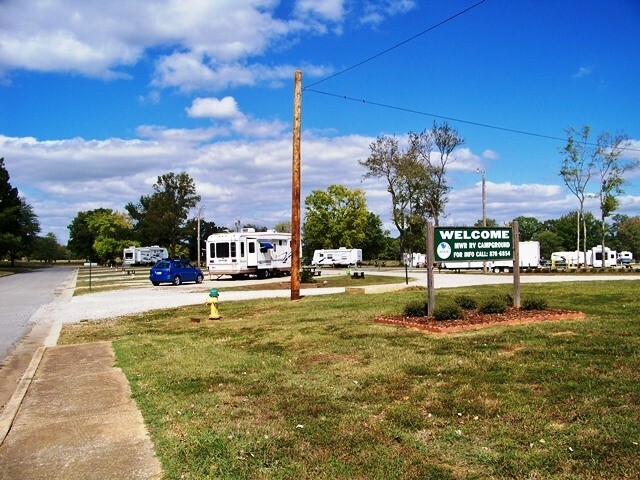 At the campground, turn right onto Nike Street and continue to the campground entrance. 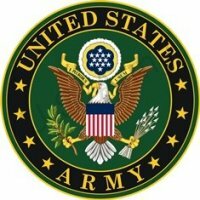 Active, National Guard, Reservists, Retired, 100% DAV, DoD civilians, NASA employees. Reservations are highly recommended and are accepted 90 days in advance. A 5-day cancellation notice is required for a full refund. 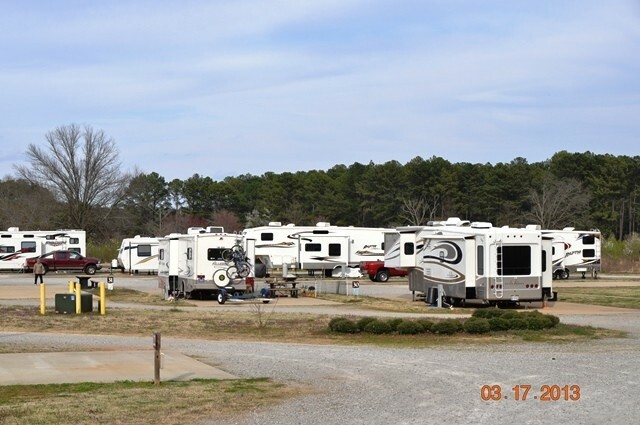 Sites 2 and 3 are designated for overnight campers only. Reservations will be accepted based on availability. As this is a military post, make sure you are retired, active, or civilian/contract employee to have access to base before calling for a reservation. Free limited WiFi at the RV Park. 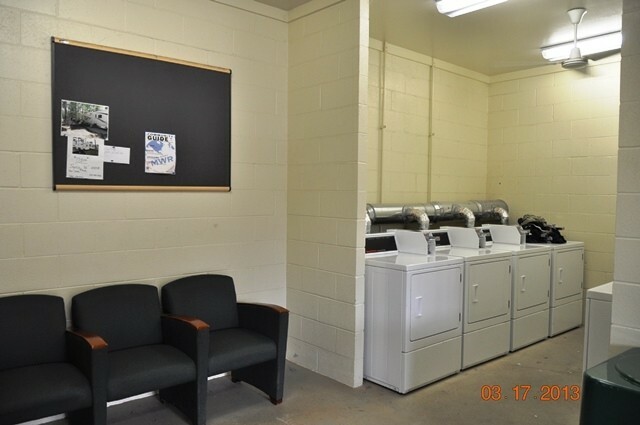 Directions are inside the laundry facility with user password. Must use local General Delivery or open a private PO Box. Allowed with usual leash and clean-up rules. 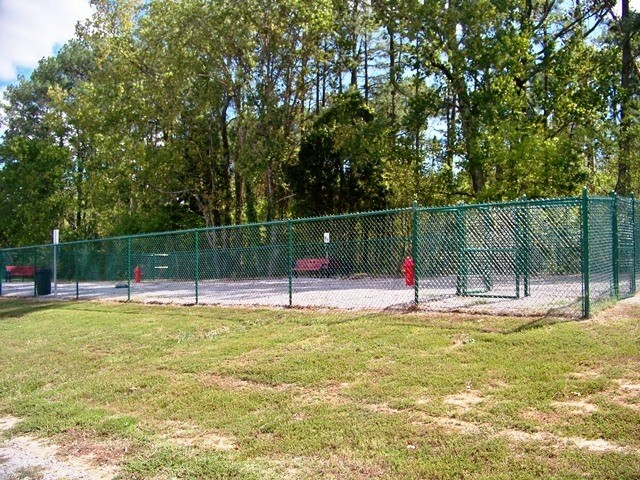 Fenced dog run at the RV park. HUGE concrete pads 25 x 65. Stay limit is 60 days during peak season and 90 days during non-peak season per SOP and AR-215 regulations. Sites 2 and 3 are designated for overnight campers only and may use the self-check box. Stays for longer than 1 night should make reservations via telephone or check in at the Outdoor Rec office to insure availability (sites may already be reserved). 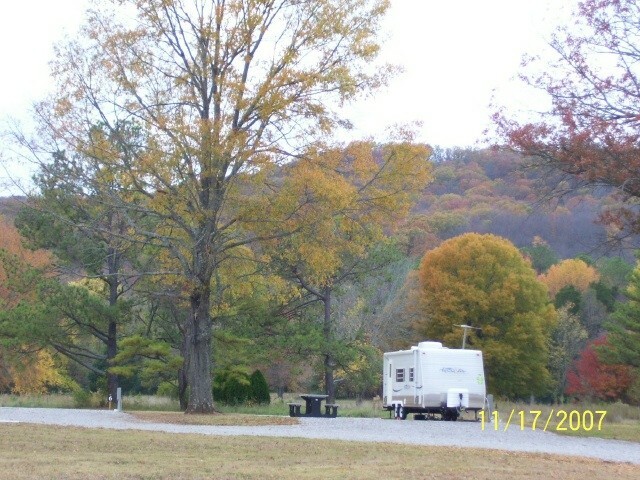 Limited cable TV, RV Storage lot, Dog Run. 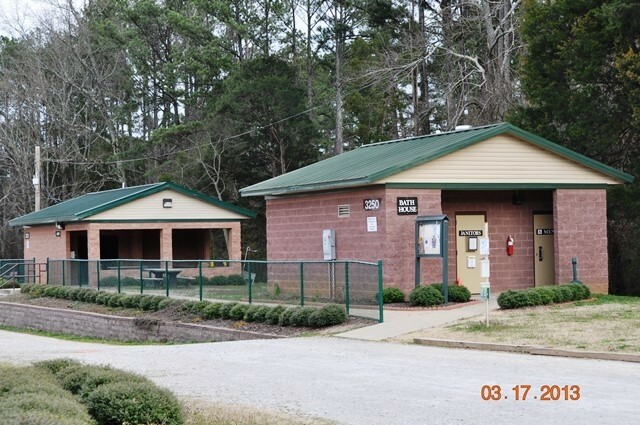 Other MWR facilities on post such as Outdoor Recreation (equipment rental), bowling, bingo, golf, Officer's Club, and more. Firearms are prohibited on post. The Department of Defense (DoD) Interactive Customer Evaluation (ICE) system is a web-based tool that collects feedback on services provided by various organizations throughout the Department of Defense (DoD). Click the ICE logo to submit your evaluation on this campground directly to the responsible department. The newer second campground located at Redstone Arsenal. 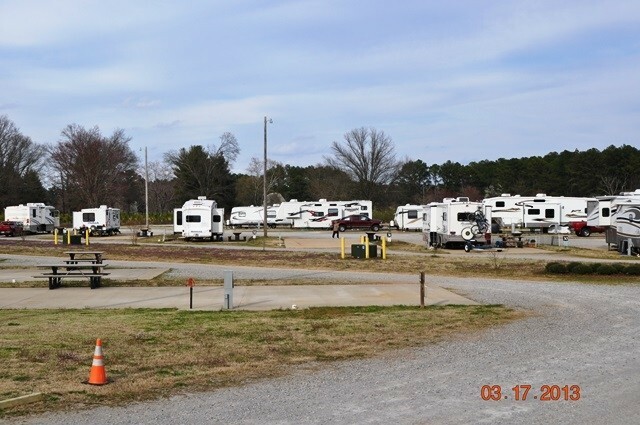 Nice RV Park with spacious sites, dog run and laundry. Close to commisary exchange and gas station. Very nice walking trails. Huge cement pads with pull thrus from spots 15 - 70. Spots 8 -14 were back in with hookups to far forward actually at my front door of motorhome. 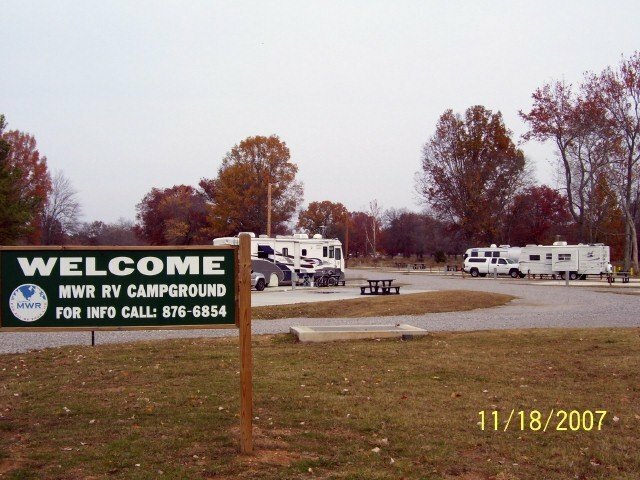 This is a realy nice campground and we would always go back. They need to get rid of the abandoned truck and travel trailer on spot 1 for camphost which has been there fora year. We never saw this guy. Two new camphost on spot 14 and 70 are working to make this one of the best campgrounds we have stayed at. No swingsets or playground for children. We have a site in the newly opened area. 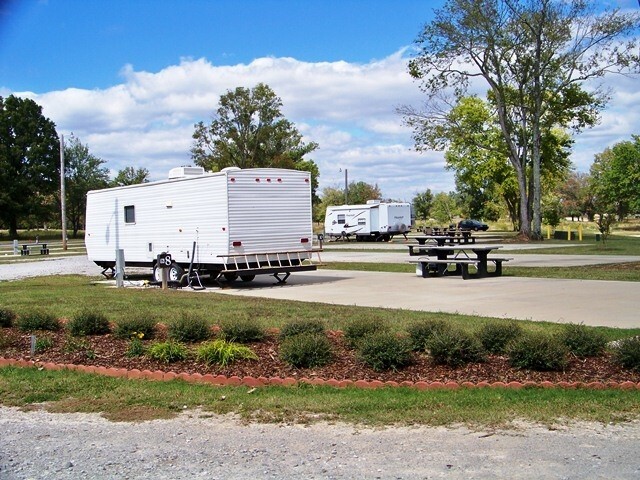 The concrete pads are huge, plenty of room for our 43 foot motor home and tow car. Utilities are well placed and water pressure is high. Close to Commissary and PX. The new Gate 9 is very narrow so go slow as you enter. Had a pull through site. Large pad. Jogging path next to park. Clean bathhouse but only one shower. No cable. Mwr said no free cable but can be purchased through local cable company. Huntsville has everything in close vicinity. New addition with 28 sites complete and awaiting opening. Nice campground. Full hook-ups up to 50 amps all sites. Huge pads. All but second row, sites 7-14 are pull through. Some of the hook ups are well forward which takes away most of the site for parking unless you have really long hoses and cables. Main gate is gate 9 at Redstone. New gate has been built in the past few months but still was tight for my 40 foot Tiffin Phaeton. I’m former Navy, but...Army did good. OBTW, they are building a bunch of new sites adjoining the ones here already. That will really be nice for busy season. Made a reservation for Feb.4-11.Arrived on Feb 4 as planned, 4 days into our stay the camp host finally put the check-in/checkout paper in the box, showing our arrival as Feb.3 and checkout on Feb.10. Called billeting to try and get this straightened out and was told "Well that's what we have written down, so that's what it is." So we payed in advance for 7 days and only were allowed to stay 6 because of what they had written down. Campground is primarily homesteaders. 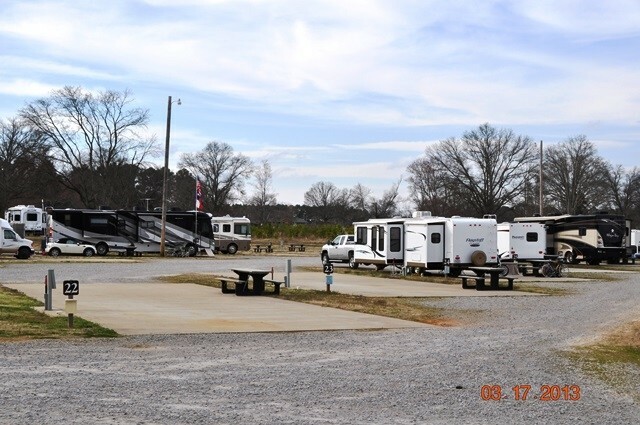 Currently construction work is being done to add more spaces to the campground so be prepared for noise. Laundry is nice. There is a change machine and a detergent/fabric softener machine, neither work. Very close to Xpress,commissary and PX. 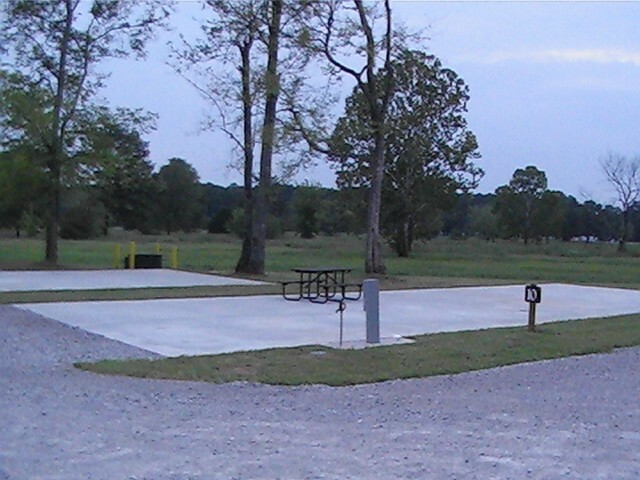 The nicest thing about this campground is the wide concrete pads. Definitely won't be coming back. Stayed here during the Huntsville Hamfest. It is located close to downtown and the Von Braun Center. Lots of eating places nearby. No office on site, but made reservation on the phone and just came and went as I wanted. They could use some trees to provide some shade again the Summer heat. Could not get a WIFI connection but no big deal for me. Very nice concrete pad for parking the RV and truck. Great campground. All sites are pull-through full hook-up. Big concrete pads and long sides. More than enough room for our 35' motorhome and out toad. Sites are level and utilities are an easy connection. There is no office on site. There is a campground host. Call ahead for a reservation, they will assign you a site and you just drive to it and park. Be sure and follow the directions on this site, and not the brown signs on the base, or you will end up pointed the wrong way. Bathhouse facilities are small but clean. Only on shower each. Nice well equipped laundry site. Plenty of nice place to walk your pet. Even a paved jogging trail through the forrest right near by. We had good reception of all the local major TV stations and good satellite reception. Verizon connected fine. Wifi signal is week but connectable. You have to get information about the WiFi up in the Laundry building. If you are coming to the area, or want an nice short term, this is a great place. Clean, safe, big sites. As we were arriving at Gate 9, they flagged us over to the far right and a wide width gate entrance. It was closed, but they opened it for us. Stayed here in our motorhome. This is a great stopping place and the campground is wonderful. One mishap, however: we came in thru gate 9 just after 5:00 p.m. And only the left two gates were open. They are barely wide enough to get thru with an 8 ft wide travel trailer, and the top of my trailer hit an overhead outdoor light about 9 ft high sticking way out into the lane. I think the gate guard should step out and volunteer to open a right hand gate (wider) when they see a full size travel trailer approaching for entry. Another camper told me it's a chronic problem and that another person had their awning torn off trying to enter the same gate. I now have a nice long scratch in the gel coat of my new Keystone Cougar! Otherwise, we'll be back but next time I will pull in front of the right most gate and wait for someone to open it. Stayed on site #4 for 5 nights. Site was wide, long and level. Water pressure was very good. Access to the campground was easy and directions found here are accurate. There is no cable for short term stays. 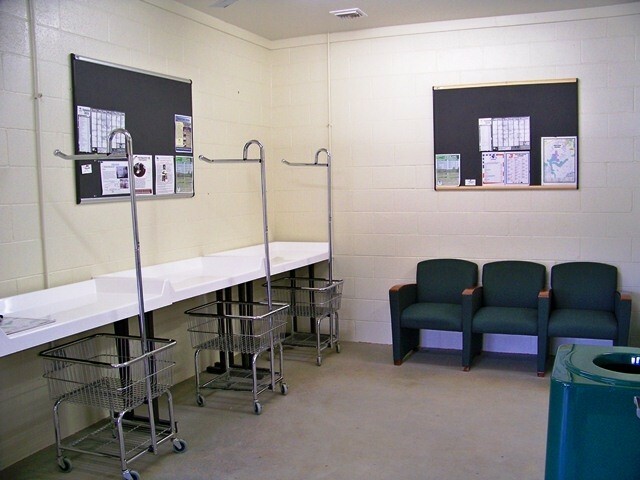 Facilities are clean and well maintained. Enclosed dog run is a nice benefit particularly for dogs who like to explore off the leash but must use them at most campgrounds. Camp host was friendly and helpful. Never met or interacted with any of the MWR staff. Commissary and Exchange are a short walk away and sufficiently stocked to meet your needs on the road. Only negative observation is that there appears to be a lot of long term campers in the park. Every day we witnessed some of them shuffling their rigs to new sites in the park when their 60 day stay limit was up. Very good facility. Easy to get in and out. Good amenities. Clean. Manager at the commissary was very helpful. Manager at camp ground was very friendly and helpful. Perfect for our use! Big, level concrete spaces with super easy access. We arrived 10:30 at night and found a late arrival was very easy and uncomplicated. All facilities were very clean and well kept, with the only exception being a few low-lifes who don't pick up after their dogs! We travel with 4 dogs, so not a hater, just don't appreciate others not picking up! Base facilities are very close and the gas station is big rig friendly too. 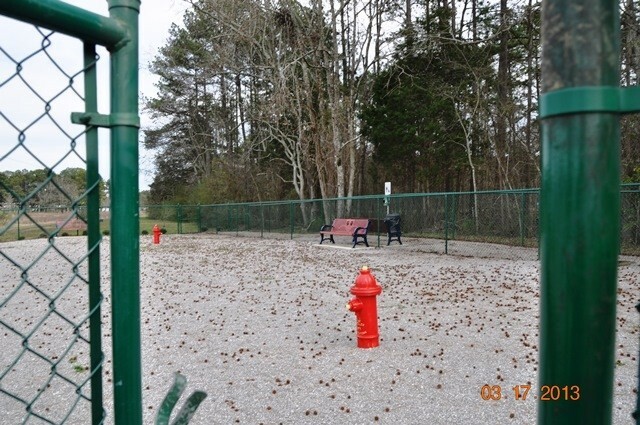 Dog park is a nice addition to give our dogs a little running room! Very quiet and secure with base police driving through periodically. November 2, 2014... once again the directions have changed. As of today: Take Exit 14 as directions indicate. Once you've passed through Gate 9, travel approximately 1/4 mile until you reach the first stop light. Turn left. Despite the fact that there are no street signs, this actually is Goss Road now! It essentially now turns you back the direction you came from (back -toward- Gate 9) but you are now on the base and paralleling the road you entered on. It will eventually make a long sweeping right curve and you'll now see signs indicating you are on Goss Road and it becomes two lanes. Follow Goss Road 1.5 miles. You'll see an "RV Campground" sign on your right just before Jupiter St. Turn right onto Jupiter St. and follow it on into the campground. The information re the shoppette if you go too far is still correct. Per the folks at MWR, plans are in the works to revise the Gate 9 access, so this may very well change again in the future. Changes at Gate 9 make it easier to get to campground (see Note below). We stayed in space 15 directly across from laundry and bath house. Made our reservations via phone and just pulled in. They have name/dates of your stay and your receipt in a Lucite letterbox on your site. Couldn't have been easier. This is a well kept facility. Pads level and large. We did not use bath house but did do laundry and everything was clean and convenient. We found the information about Wi-Fi access in the laundry building. They apparently change access codes frequently and it is written on the white board inside of the laundry room. Flyers are also available to help you get on the first time -- you will then set up a courtesy account via MWR Lodging. There is no longer cable available for short term stays. Those staying longer have to make arrangements with local provider. Information can be found on the information boards at bath house. We didn't really see anyone our entire stay, but it rained almost continuously and part of the time was a weekend. However, we did get a note on our door while we were gone one day, letting us know that weather alerts had been issued and that the bathhouse was the emergency shelter. 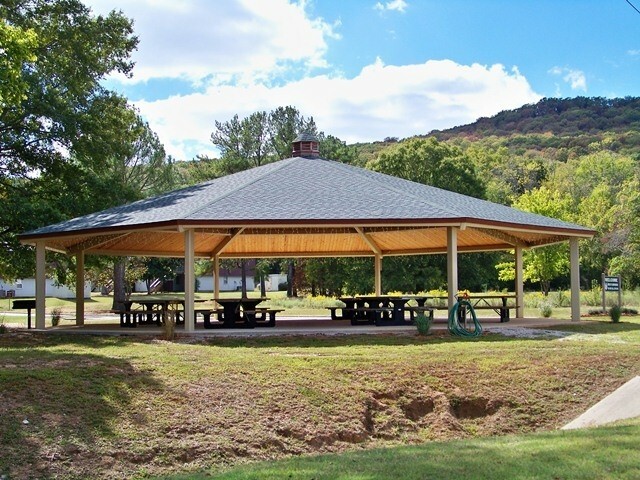 We would definitely return and would highly recommend this campground to others for convenience, cleanliness, and accessibility to local area. NOTE: One slight change in directions. When you enter Gate 9, they have put in new roads and you no longer have to make the U-turn noted in directions above. You go to the first red light and turn left onto Goss Road and follow that until you see the campground sign. If you get to the Express (Shoppette) you have gone to far, BUT you can turn right at the shoppette, turn right again on Jupiter (Commissary and PX would be left turn), and follow Jupiter as per directions above. All sites are near perfect, long, wide and concrete, pull thru, but NO shade. It's HOT in AL in summer. Each site rises just a little from rear to front. Even the hookups are in concrete next to the parking pad, no dirty lines to put in the unit when moving on. Not BBQ, yes picnic table. I had no contact with anyone about our stay, I had a pre-paid reservation. There is a camp host but I never saw him/her. The bath house is clean but small, 2 toilets, 1 shower. The laundry is clean and only $1 to wash or dry. The walking/biking trail is about 100 yards southwest. The PX and commissary less than 1 mile east. The directions are right on, easy access, no need to scout for problems. Great FamCamp. Stayed here 3 nights. 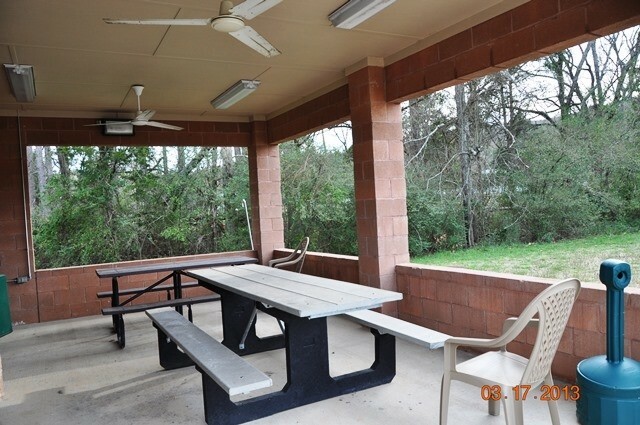 Very large concrete pads, great laundry facilities. Very close to PX and Exchange. Car wash was great also. Watch diesel prices in town. Range from $3.74 to $3.62 per gallon. Gas Buddy helped a lot. Will stop here again if we are ever in the area. Stopped by to check the RV Park out. It was a cool and cloudy Fall day. There were still about 6 - 9 RV sits available. 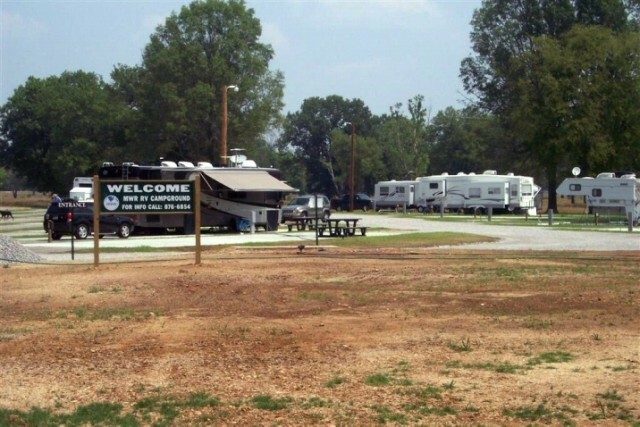 This is an RV Park we wouldn't mind coming back to and staying at for a month or so. Glad to see the have the proper stay limits posted. We didn't notice any homesteading abuse. If you are looking for a quiet place, you've found it. There was very little noise and the campground has almost no traffic. Sites are long and concrete, electricity is great, cable is clear and Wi-Fi was very strong. You are close to gates and Huntsville has lots to offer. Be sure to check out the small historic area downtown in their Constitution Village. Many of the buildings remind you of Williamsburg. Remember to call ahead for your campground reservation. We overnighted in Redstone. I called (Jordan?) to make reservations, was charged and was given our site number right over the phone. How sweet that was. We followed the directions given, drove slow through the campground and went right to our site. The concrete slab was the biggest I've ever seen. Since we needed a few things for the galley, we walked a short two blocks to the commissary and back. This FamCamp was just what we needed for an overnight stay. Thank you Redstone MWR.